How to visualize your own mutations? 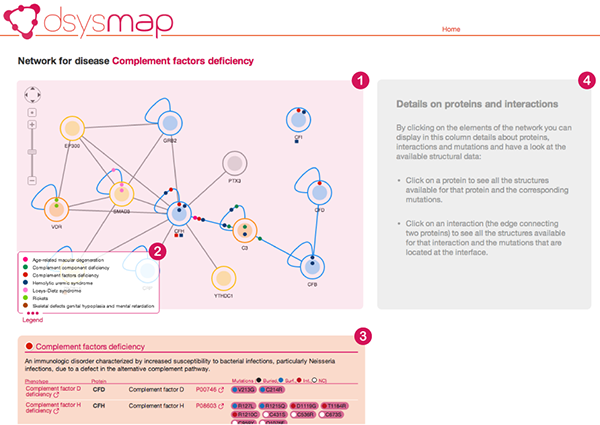 dSysMap is a resource that maps mutations related to human diseases on the structure of proteins and interactions in the human interactome. Human disease-related mutations are obtained from Uniprot and are mapped on the structures of single proteins and protein-protein interactions obtained from Interactome3D. By mapping mutations on the human structural interactome we can classify them based on the position they have inside the structures as buried, surface or interface mutations. Furthermore, we can locate their position inside the interactome and determine if they affect the nodes in the network (buried or surface mutations) or the edges (interface mutations) and we can also relate mutations for one disease to the ones for other diseases that affect the same protein or proteins in the interaction neighborhood. This allows to put disease-related mutations in a systemic context and helps in rationalizing the mechanism of action of those mutations and unveil previously unkown relationships between diseases. dSysMap is pronounced dee-sees-map similarly to Disease map. By selecting a disease from the list of diseases. Diseases are classified into categories (obtained from the Comparative Toxicogenomics Database). You can either browse the hierarchy with your mouse or you can type the name of a disease in the search box. The hierarchy will scroll to the first disease whose name match your input. By searching for a list of proteins of your interest. 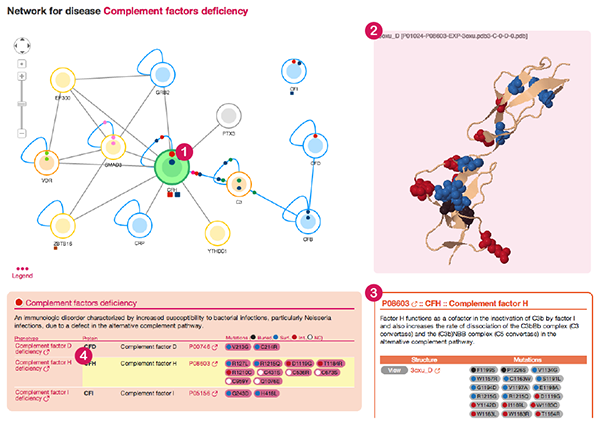 You can enter a list of proteins and visualize their interaction neighborhood together with the mutations that affect those proteins. By introducing your own list of mutations. See below for a description of how this works. By querying dSysMap in one of these way you will be directed to a page representing the resulting network of proteins together with the disease mutations that affect them. See the following section for a description of this page. The page showing the results of a query to dSysMap is similar to what is shown in the following image. 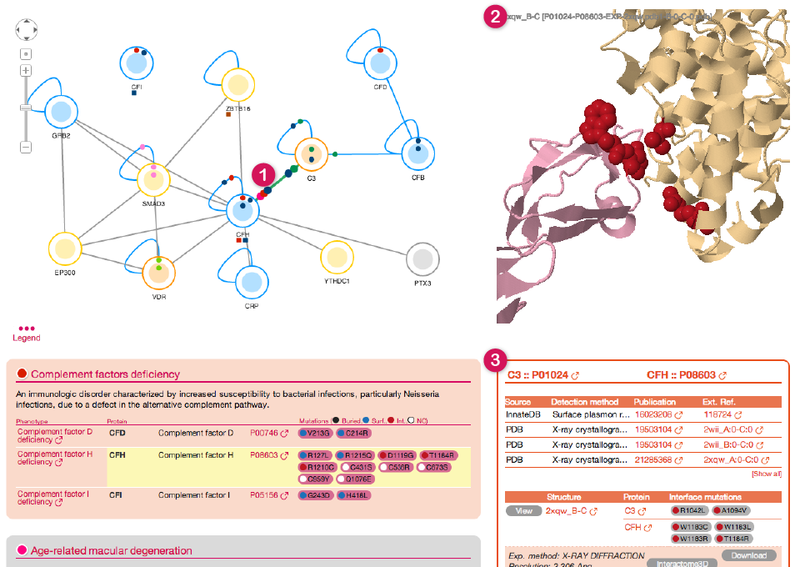 At the top of the page you can find an interactive representation of the network of proteins resulting from your query (1). Nodes in this network represent proteins while edges represent protein-protein interactions (PPIs), as collected from public PPI databases. Mutation discs on an edge represent disease mutations that can be mapped to the interface between two proteins and might therefore affect the interaction between the two proteins. Discs on an edge are closer to the node on which the corresponding mutations are found. In the following image, for example, mutations represented by the disc "a" are found on protein 1 while mutations represented by the disc "b" are found on protein 2. It is IMPORTANT to note that one mutation disc represents all the mutations for a specific disease in one of the structural categories (buried, surface or interface). Therefore, one mutation disc might correspond to multiple mutations. where md,P,(P,Y) is the number of mutations for the phenotype d that can be mapped to the interface of protein P in the interaction (P,Y), md,P is the number of mutations for the phenotype d that can be structurally mapped on protein P, rP,(P,Y) is the number of residues that belong to the interface of protein P in the interaction (P,Y) and rP is the number of structurally mapped residues for P. We assessed the significance of the enrichments through the p-value of a binomial distribution of parameter p=rP,(P,Y)/rP. 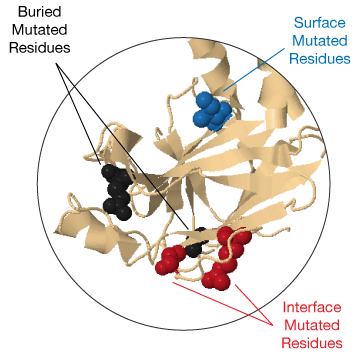 Whenever the mutations were present on both sides of the interface, we calculated the enrichments on the sum of the residues of the two proteins. P-values were corrected for multiple testing on the number of interactions for each disease phenotype, using a Benjamini–Hochberg procedure. Interactions enriched for mutations of a disease. Mutations for disease (a) are enriched on the interface of the interaction between the two proteins. This is indicated by a circle around the mutation disc. Self-loops represent homomeric interactions. Below the network we can find a list of diseases that affect the proteins in the network. The remaining boxes in gray (8) correspond to other diseases that have mutations on any of the proteins in the neighborhood of the main disease. 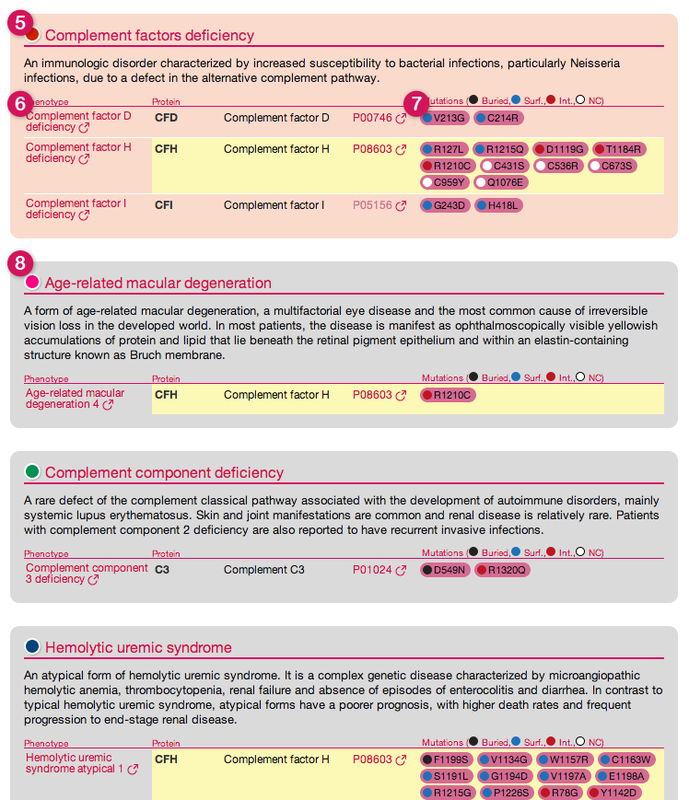 By showing also these diseases, dSysMap helps in establishing relationship between them and possible common mechanism of actions. The Network view is interactive. This means that you can move the nodes around, and you can select proteins (by clicking on the nodes) or interactions (by clicking on the edges). 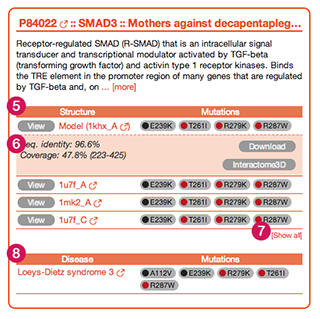 When you select a protein or an interaction dSysMap shows their corresponding details (including their structures and the mutations that can be mapped on them) in the right panel (4). When you click on a node in the network, dSysMap will show information about the corresponding protein in the right panel. At the same time the protein is highlighted in green in the Network view (1) and with a yellow line in the list of diseases beneath (4). In case there are structures or models available for the selected protein they are shown on the top part of the right panel (2) in a JSmol view. The view is interactive: you can move and zoom the structure using the mouse. Mutated residues are highlighted with a sphere representation and are colored based on their position in the structure (black for buried residues, blue for surface residues and red for interface residues). The lower part of the right panel (3) shows information about the protein. 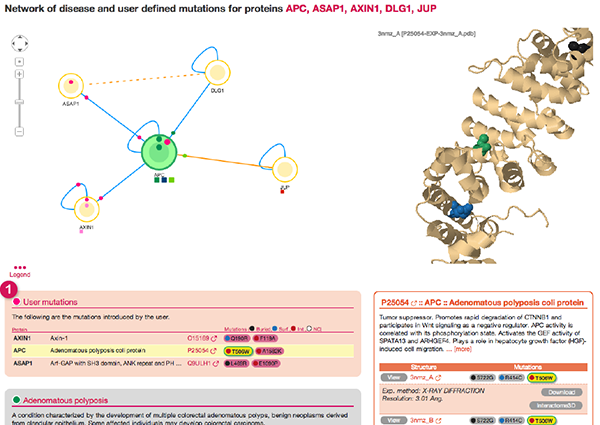 After a short description of the protein function (obtained from Uniprot ) you can find a list of all the structures and models available for the protein (5). By clicking on the view button you will be able to see the corresponding structure in the JSmol view above. For every structure the mutations that can be mapped on it are listed. Furthermore, you can see details for the structure (6) currently shown, together with a button for downloading the corresponding PDB file and a link to the corresponding entry in Interactome3D. Be aware that, by default, only the first 4 structures are shown. If you want to show all the structures you can click on the link at the bottom of the table (7). 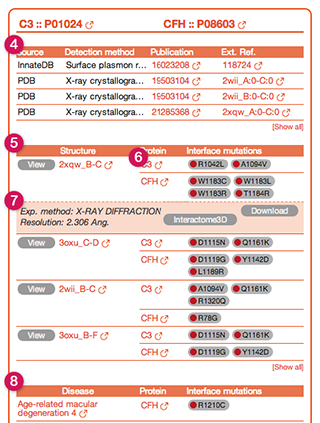 Finally, a table shows all the prenotypes having mutations that can be mapped on any structure of the selected protein (8). The different views in dSysMap are linked together. 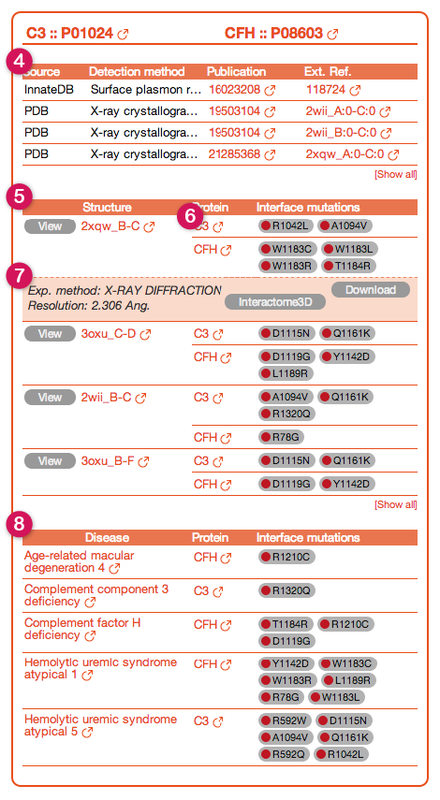 If you click on any mutation (9) (see next image) that has a structural classification dSysMap will highlight in green the mutated residue in the first available structure for the protein (10) and throughout all the page (9) and (11). The same happens if you click on one of the mutated residues in the JSmol view. By clicking on any edge in the Network view you can visualize information about the corresponding protein-protein interaction. The corresponding interaction gets highlighted in the network (1), available structures are shown in the top part of the right panel (2) together with information on the PPI below (3). On the top, you can find a list of all experimental evidence for the interaction (4) with links to the original protein-protein interaction databases. Below (5) a table lists all the structures and models together with the interface mutations that can be mapped on them. Please, be aware that on this particular view *ONLY* mutations at the interface between the two proteins are shown. 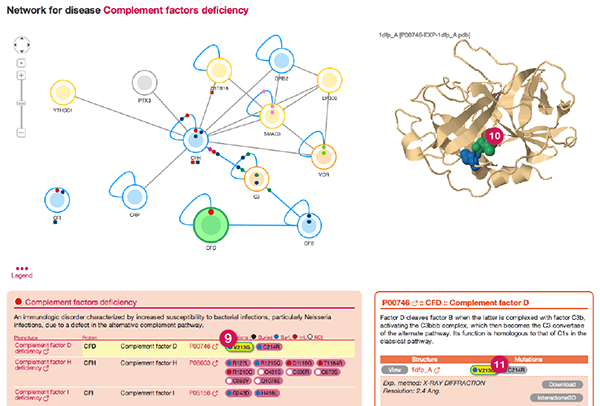 The rest of the mutations affecting the two proteins can be shown by clicking on the two nodes individually. 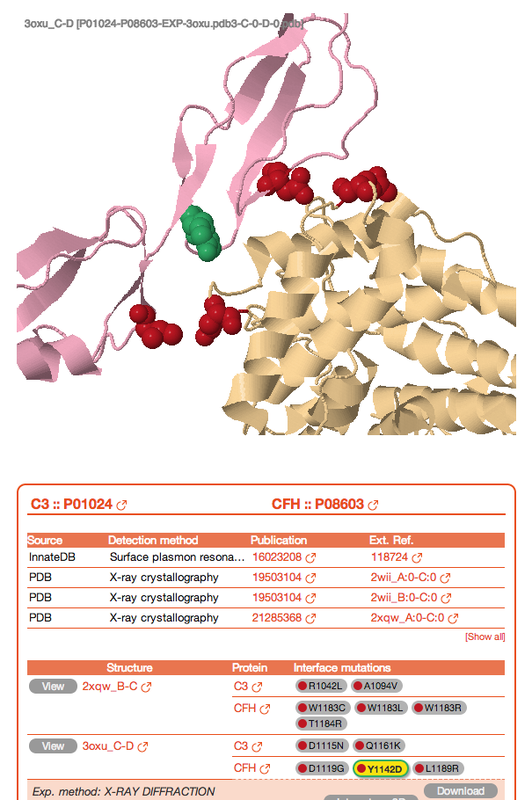 The table also reports details about the structure shown in the JSmol view and links to download the corresponding PDB file and view the corresponding entry in Interactome3D (7). Finally, at the bottom, a table shows all the phenotypes related to mutations that can be found on any interface for the selected interaction. 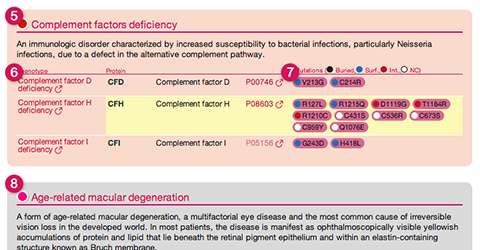 By clicking on any of the mutations in the right column you can highlight it in green in the JSmol view above. 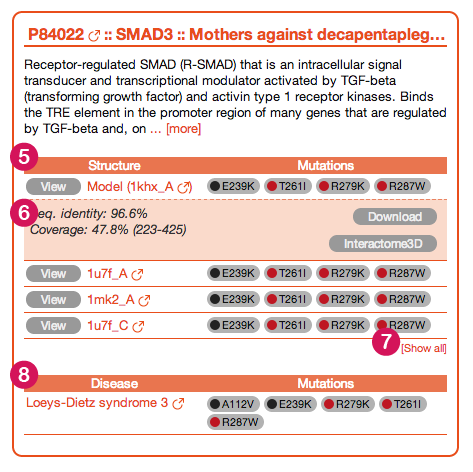 dSysMap gives you the opportunity to display your own list of mutations on the corresponding network together with all the other disease mutations contained in the database. In order to do that you have to enter your list of mutations in the input box on the right bottom corner of the home page. Each mutation can be specified as p.<original_residue><residue_number>[mutated_residue] (ex. the mutation of Arginine 254 to a Lysine should be specified as p.Arg254Lys). You can also use the simplified notation <one_letter_original_residue><residue_number>[one_letter_mutated_residue] (for ex. R254K). The mutated residue is optional, i.e. you can specify a mutation at a certain residue without having to specify the amino acid it is mutated to (for ex. R254). 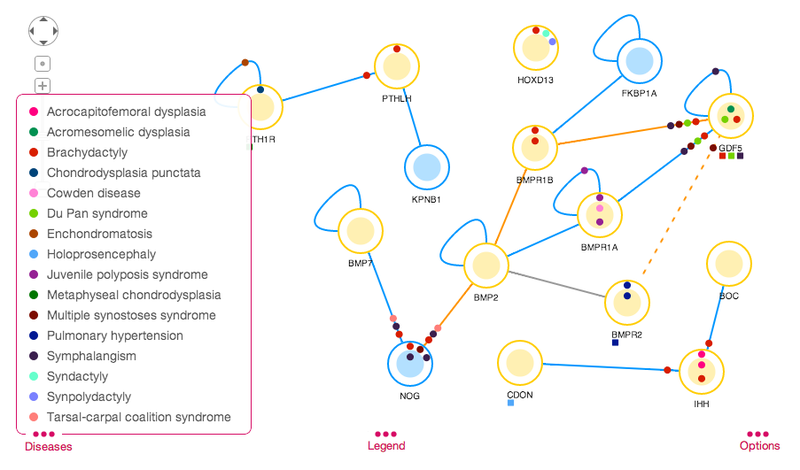 Once you click on Submit you will get to the Network view and your list of mutation will be listed together with the other diseases in a separate box with the title User mutations (1). The Download page allows you to download the data contained in dSysMap in different ways. 2 PHENOTYPE Name of the specific phenotype. 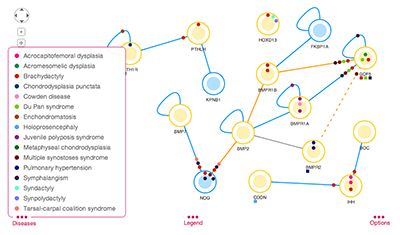 dSysMap groups different phenotypes belonging to the same disease. 1 STRUCT_TYPE Type of structure; can be one of: Structure (for experimental structures), Model (for homology models from global templates), Dom_dom_model (for homology model from domain-domain structural templates). 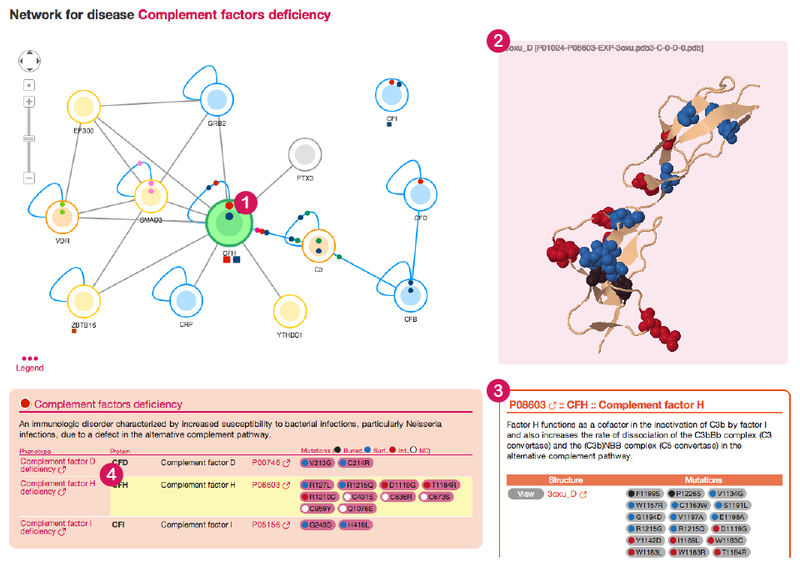 See the Interactome3D help for a description of the different types of interaction structures and models. getMutationsForProteins It returns all the mutations mapped by dSysMap on a group of proteins. It takes one parameter protein_ids encoded as a comma separated list of protein IDs (no spaces allowed). The protein IDs can be either Uniprot Accession Codes or gene names (valid in the version of Uniprot used by dSysMap, see the statistics). A maximum of 10 protein IDs can be passed to the function. mutations Contains a set of mutation records whose fields are the same as the ones in the file <dataset>_mutations.dat that was previously described, encoded in XML. structured_residues Contains a set of structured_residue records whose fields are the same as the ones in the file <dataset>_mutations_prot_structs.dat that was previously described, encoded in XML. 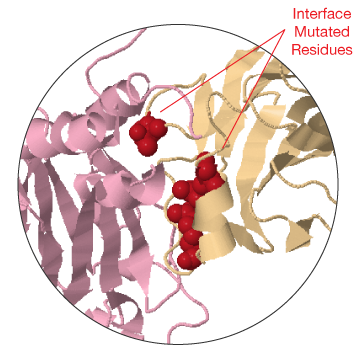 interface_residues Contains a set of interface_residue records whose fields are the same as the ones in the file <dataset>_mutations_interf_res.dat that was previously described, encoded in XML. The returned value has the same format as the one of the previous function getMutationsForProteins. You can specify up to 10 mutations in total. getPdbFile It can be used to retrieve the PDB files contained in dSysMap (either experimental structures or models used for the structural mapping of mutations). It takes one parameter filenames encoded as a comma separated list of filenames (no spaces allowed). The filenames must correspond to the ones contained in the pdb_filename field of the results returned by either one of the other functions (or in the files downloaded from dSysMap). A maximum of 10 filenames can be passed to the function. The function returns an XML file which contains a main element named results. This element contains as many pdb_file children as the files that were requested, each containing the contents of the corresponding PDB file. 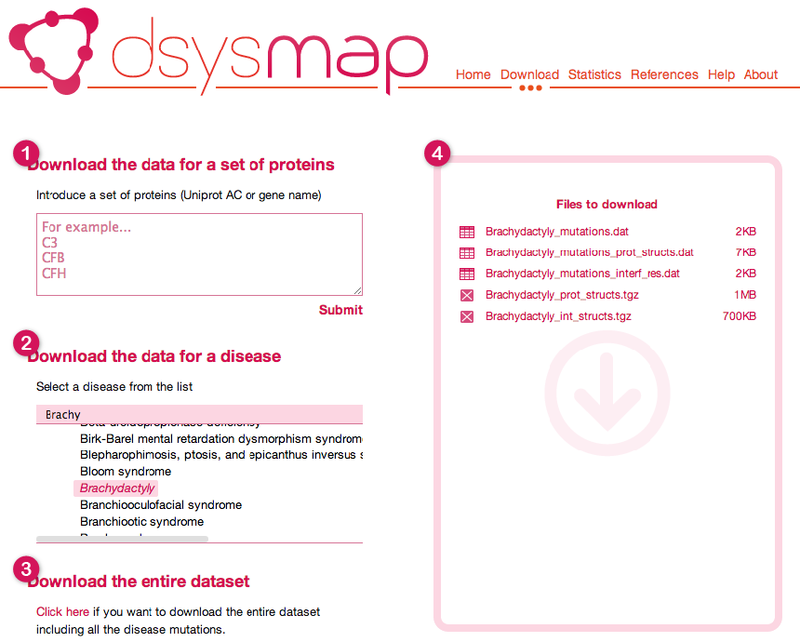 dSysMap is provided by the Structural Bioinformatics and Network Biology Group at the Institute for Research in Biomedicine. Last modified: 25 November 2014.